At Thanksgiving, I was visiting family in Pittsburgh and met the owner of Cafe Fifth Avenue. It's a bar and restaurant that's right next to Consol Energy Arena where we always take in a Turkey Day Pittsburgh Penguins hockey game. He serves up some mighty tasty chicken wings and through the course of the conversation (and a couple of cold beers), he sent me home with a bag of the seasoning that uses for my very own. If you're in Pittsburgh, please stop by and try his chicken wings. They were awesome! I'd been itching to try this on fried chicken, but due to life circumstances in and around the holidays I've been trying to eat a little better and fried chicken just hasn't been on my list. 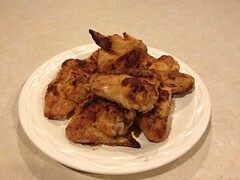 But Sunday, I deciced to try and adapt a recipe for "oven fried" chicken to the grill. 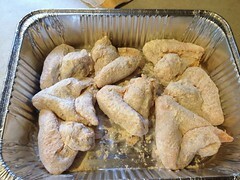 So I soaked a package of chicken wings in buttermilk, seasoned the flour with my new chicken seasoning, and placed the wings in a disposable pan. While this seemed like a reasonable approach, I don't think my fire was every really hot enough. Towards the end I finally got it where it should have been all along, around 425 degrees. I did pull the wings out of the pan and crisp them a little directly over the fire at the very end. 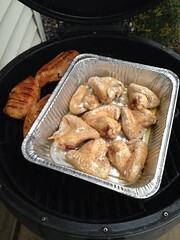 All in all, the wings were tasty and preferred by my kids over the chicken breasts that I was also grilling. I'll probably give this another try soon and I'll use a little more of the seasoning on the chicken. Heck, the Super Bowl is coming up and you can't go wrong with chicken wings at a football game, now can you?